When I finish my breakfast and my blog post, I will get dressed and brave the uncharacteristically cold air - it is minus 18 on April 5th - and do my final preparations for a trip down to Calgary. 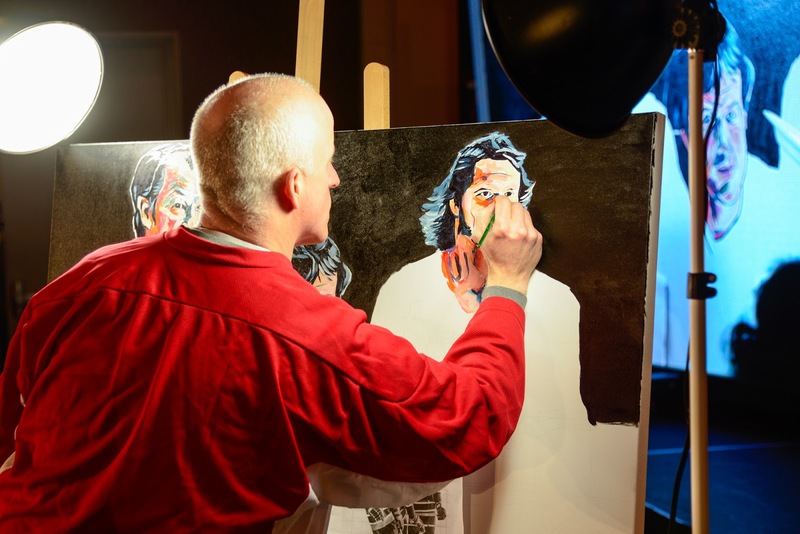 For the second year in a row I'll be doing a live painting at the Gordie Howe C.A.R.E.S. ProAm hockey tournament luncheon. I always get a little nervous in the days leading up to these big events. It's not the large crowd or the NHL stars that intimidate me, it is the work itself. I have a certain amount of time to get the painting done so it can be auctioned. Last year's event in Calgary was particularly daunting as circumstances were such that I lost a full hour of planned painting time. 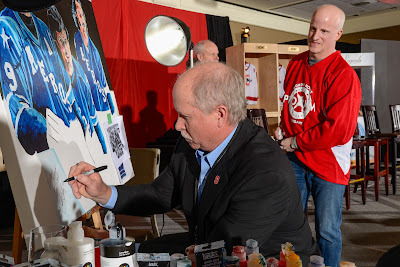 I was doing a large portrait of Gordie, Mark and Marty Howe, with the two brothers at the event watching me. It was intense. 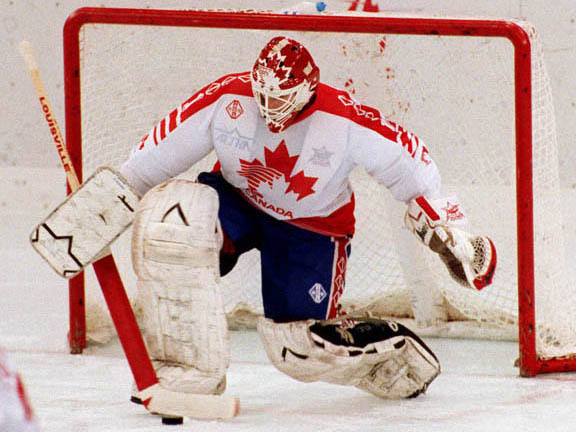 My subject tomorrow morning will be Sean Burke, who played 18 seasons in the NHL and was goalie for Team Canada at the 1988 Olympics in Calgary. As it is the 30th anniversary of those games, it makes sense that he is the focus. He will also be at the event and participating in a hot stove. Just before we auction off the painting, he will add his signature, and we will hopefully raise thousands of dollars for Alzheimer's and Dementia care and research. While I often talk about not spending time in my head when painting, the facts of a gig like this dictate that I go in with a completion plan. In other words, I have a set number of hours to get the main elements of the piece done so that the auctioneer has something to work with. Thankfully, I don't have to get it 100 percent complete, as I always make the arrangement that I get to take it back to the studio for final touches. This is the first of four major live painting appearances in April. The next is on April 19th at the Timeraiser here in Fort McMurray. I'll be painting someone who exemplifies the spirit of volunteerism. I haven't figured out who that is yet, so if you have any brilliant ideas, please let me know. The key is that the subject needs to have a universal quality that will appeal to a broad spectrum of the attendees. People will be bidding on the painting with their volunteer time. Near the end of the month, I will travel down to Edmonton for two events in a row. The first is the Alzheimer's Face-Off, the event last year where I did the portrait of Connor McDavid that sold for an astounding $18,000. The next day is a fun fundraising event for the Interior Designers of Alberta. I'm grateful for all these opportunities as they stretch my skills and allow me to introduce myself to new audiences. They also allow me to help various charities raise money for their important work. That is incredibly humbling.